Amazon has Magformers Building Kit, Paw Patrol Colors for $18.29 (Reg $50). Magformers is one of the industry leaders in magnetic building toys for children. We believe it is vital for children to develop through creativity. Our ‘always attracting’ magnetic technology delivers a unique constructional play experience. 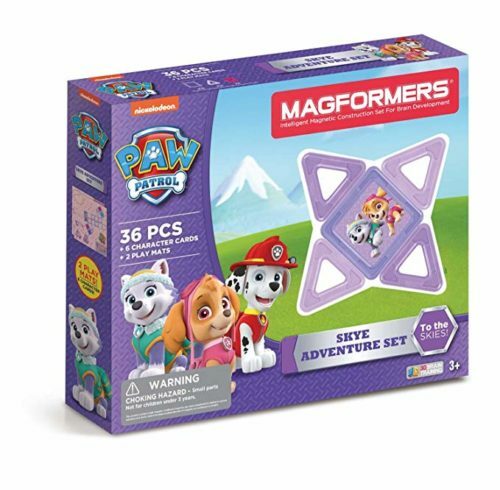 Arriving in Paw Patrol Skye and Everest colors, the Skye Adventure Set contains 18 magnetic squares, 12 triangles and 6 inserts as well as 6 double-sided character cards and 2 Play Mats that you can use to build Pup Houses, Magformers Magic ball and more! Match colors, shapes and characters to 2, 1:1 scale 2D net Play Mats. Pull your ideas up into 3D, perfect for STEM education. If you aren’t an Amazon Prime member, now would be an awesome time to join!